I am here today to discuss ice cream. Perhaps that seems inappropriate — it’s the peak of autumn, the northeastern portion of the United States has been hit by a devastating storm (electricity for an ice cream machine truly the least of most people’s concerns), Sandy continues moving north and, my mother tells me, it’s snowing (SNOWING!) back in Michigan. But what is ice cream but a comforting indulgence, one to savor as you clink your spoon against the bottom of the bowl to capture every last bit of melted flavor, echoing the way we’re all striving to live life to its fullest? If you ask me, that is appropriate for all seasons and all times. Or maybe I just like ice cream. Regardless, I wanted to share this recipe with you as its prompting was a bit out of the ordinary. The gentlemen over at The Bitten Word recently concocted quite the grand experiment, enlisting their readers to cook through all of the recipes in one issue of a food magazine. But with reader interest higher than anticipated, one issue became six issues. As someone who typically cooks just one or two recipes from a particular issue of a magazine, I’ve found it interesting to see what the spreads of recipes look like as a whole, particularly from the vantage point of home cooks, few of them chefs or bloggers and many of them venturing into very new waters with their assigned recipes. The food world we’ve created is fascinating — bloggers choose just one or two fabulous recipes to share each week; meanwhile, magazines and cookbooks feature dozens or even hundreds, curated over weeks or, when it comes to the cookbooks, years. It’s quite the editorial mix, and we digest the whole of it, often forgetting it’s not all part of the same genre. It’s always interesting to see print and the online world converge, and if you hop on over to The Bitten Word and scroll through these recent crowd-sourced posts, I think you’ll see what I mean. 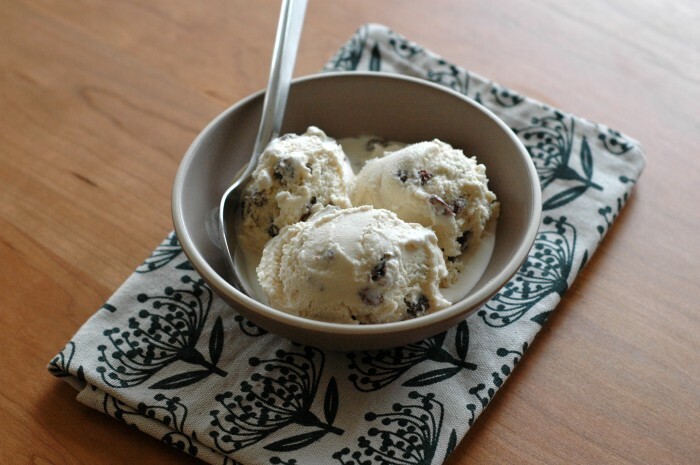 Well, as one of those interested Bitten Word readers, I was assigned the rum raisin ice cream featured in the October issue of Saveur, which highlighted 101 classic recipes in honor of the magazine’s 150th issue. (See the whole list of reader photos and reflections over at The Bitten Word.) 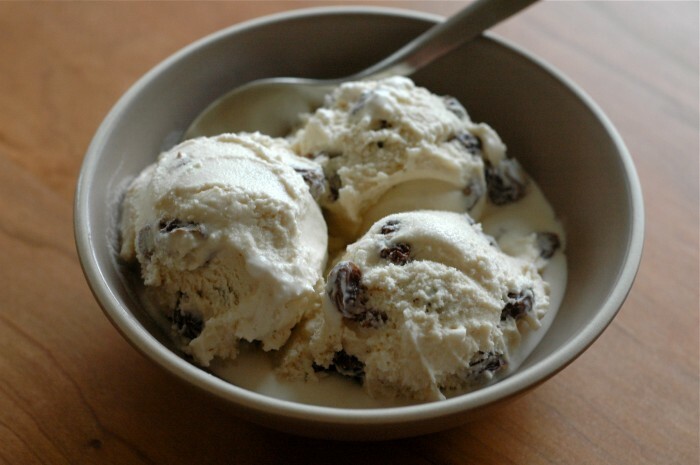 I cannot say I’d ever have chosen to make the most-iconic rum raisin ice cream if not for this project. For one, it’s not my typical choice of flavor. I would prefer to put other alcoholic substances in ice cream, like bourbon or a dark, malty beer. But more than that, this is an egg-based recipe. Now, let me explain. My personal ice-cream-making obsession is rather young and quite firmly rooted in the method developed by Jeni Britton Bauer of Jeni’s Splendid Ice Creams, which uses cream cheese rather than eggs as the protein. 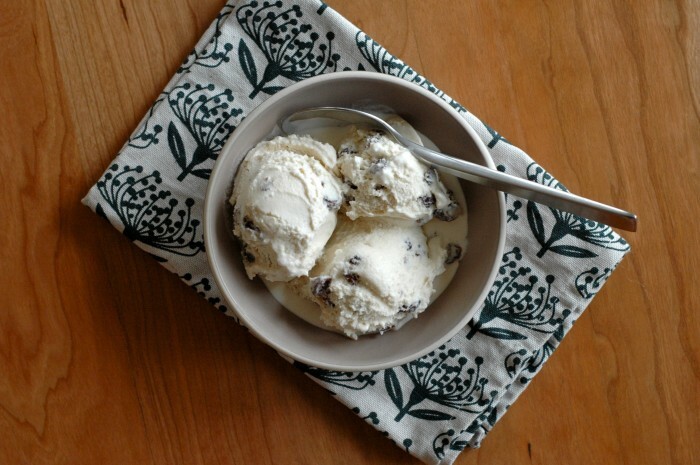 (More on my newfound obsession, that method and my current favorite ice cream later this week!) Cream cheese is straightforward, dependable, hard to destroy. Eggs, on the other hand, are unwieldy things, and making them into a smooth and lovely custard is no easy task. As it happens, this rich and boozy ice cream, like making custard and trying new things, is not for the faint of heart. It is, however, absolutely delicious. And feeling brave and accomplished? Well, that, perhaps, is the very best part. To those who were or are in the path of the storm, know that my thoughts and prayers are with you, along with the thoughts and prayers of so many others. 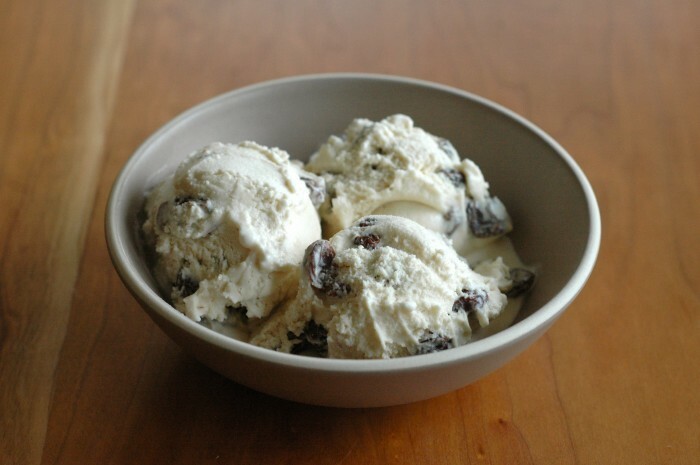 You have to plan ahead slightly for this one — the raisins need to soak in the rum for at least eight hours, and the ice cream must be frozen for about four hours before serving. Despite being a novice at the whole eggs-in-ice-cream bit, I DO know that such recipes often instruct you to temper the egg yolks with the heated dairy to prevent them from curdling. This is not one of those recipes. Thus, be sure to carefully watch your simmering pot! Other than that tricky step, the recipe is simple and straightforward. Use the rum left over from soaking the raisins for baking endeavors or a boozy cake glaze, and make some meringues or a light omelet with those egg whites. Place the raisins and rum in a small bowl, cover with plastic wrap and let sit for at least 8 hours or overnight. Drain, reserving 2 tablespoons of the rum. Set aside the raisins and reserved rum. In a 4-quart saucepan, combine the sugar and egg yolks. Whisk until pale yellow, about 2 minutes. Add the milk and stir until smooth. Place the saucepan over medium heat and cook, stirring often, until the mixture thickens enough to coat the back of a spoon, about 10 minutes. Pour the mixture through a fine strainer into a large bowl. Whisk in the drained raisins, reserved rum, cream and vanilla. Cover the custard with plastic wrap, pressing the plastic against the custard’s surface, and refrigerate until chilled. Pour the chilled custard into your ice cream maker and process according to the manufacturer’s instructions, until churned and thick. Transfer the ice cream to an airtight container and seal. Freeze at least 4 hours before serving. Your Grandpa Levitt would be pleased to see you made an ice cream recipe with eggs. That is the way he always made his homemade ice cream. I looked at the Bitten Word and was impressed to see your photo and entry there. 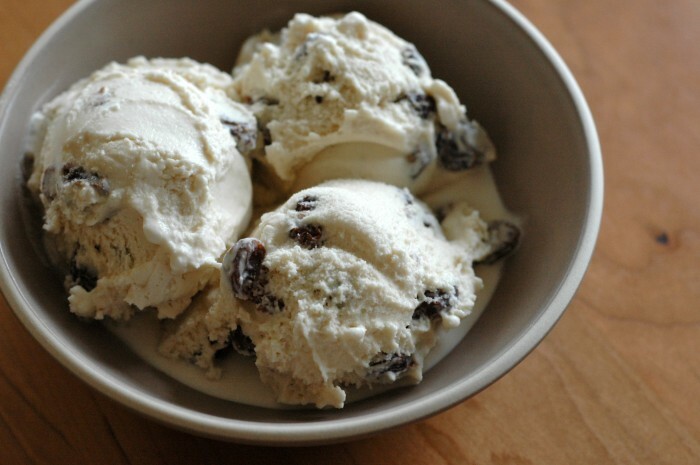 I have never tasted rum raisin ice cream…wish I could come over and try it. You make it look very inviting! Thanks :) I was glad to be reminded of the messy kitchen and late nights in the family’s cooking history; I will most likley continue the legacy whether I like it or not. I want you to make this for me! I wish I could ship it!! i really have got to try this one!